Tearing at the Seams, the highly anticipated new album from Nathaniel Rateliff & The Night Sweats, will be released March 9 on Stax Records. The lead single, “You Worry Me,” is premiering worldwide today—you can listen/share the track here: http://found.ee/NRNSyouworrymeyt. On March 9, Stax Records will release Tearing at the Seams, the highly anticipated new album from Nathaniel Rateliff & The Night Sweats. Tearing at the Seams follows the band’s critically and commercially lauded self-titled debut album, which is certified Gold in the U.S., Belgium, Switzerland and the Netherlands, Platinum in Canada and Silver in the U.K.
“You Worry Me,” the lead single from the new album, is premiering worldwide today—listen to the track here: http://found.ee/NRNSyouworrymeyt. The album is available for pre-order beginning today, here http://found.ee/NRNStats. In addition to the 12-track standard edition, Tearing at the Seams will be available in a 14-track deluxe edition that features two bonus tracks and exclusive photos. Vinyl editions include the (2-disc, 180gram) 12-track standard edition and the (2-disc, 180gram) 14-track deluxe edition, which features an exclusive photo book and special 7” single. Initial writing and recording sessions for Tearing at the Seams took place in Rodeo, New Mexico where Rateliff & The Night Sweats re-established their dynamic off the stage and in the studio. “For the first record I demo’ed everything up and created most of the parts,” says Rateliff. “This time, I felt like we’ve all spent so much time on the road that we should all go off somewhere together. We should all have that experience together.” The band finished recording with producer Richard Swift—who has helmed records for The Shins and Foxygen in addition to The Night Sweats’ debut—collectively creating a group of songs that capture the band’s emotion and intensity. Nathaniel Rateliff & The Night Sweats are: Rateliff (vocals, guitar), Joseph Pope III (bass), Patrick Meese (drums), Luke Mossman (guitar), Mark Shusterman (keys), Andy Wild (saxophone), Scott Frock (trumpet) and Jeff Dazey (saxophone). For the past two years, the Denver-based band has performed extensively across the globe headlining shows and major festivals including Coachella, Bonnaroo, New Orleans Jazz Fest, Newport Folk Festival, Glastonbury, Monterey International Pop Festival and dozens more. The band also made an immediate and lasting impression on late night television including performances on “The Tonight Show starring Jimmy Fallon” (twice), “The Late Show with Stephen Colbert,” “Jimmy Kimmel Live!,” “CONAN,” “The Late Late Show with James Corden,” as well as on PBS’ “Austin City Limits” and “A Prairie Home Companion.” Most recently, the band released their first-ever full-length concert recording, Live at Red Rocks, featuring the Preservation Hall Jazz Band, and their hit single “S.O.B.” is now certified Platinum in the U.S. and Canada and Gold in Switzerland. 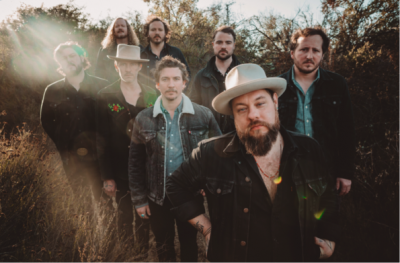 Find the most current Nathaniel Rateliff & The Night Sweats tour dates from our partners at Country Music On Tour, your trusted country concert ticket source! Country Music News Blog participates in advertising programs that help fund the operation of this site. For more information please visit our privacy statement. This entry was posted in Nathaniel Rateliff & The Night Sweats, New Music, Press Releases by Shauna "WhiskeyChick" Castorena. Bookmark the permalink.